The Roaches, with Hen Cloud, Five Clouds and Ramshaw Rocks, form a gritstone escarpment which marks the south-western edge of the Peak. They stand like a line of silent sentinels guarding the entrance to the Peak District, worn into fantastic shapes by the elements. There are a large number of Walks to be done around the Roaches from 2 miles upwards, please click on the link for more information, or you could just walk up Hen Cloud, sit and enjoy the view! The area is one of rock and heather which once belonged to the Swythamley Estate. 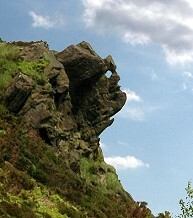 Following the break up of this estate, the area including the Roaches and Hen Cloud (an area of 975 acres) was purchased in 1980 by the Peak District National Park Authority in order to protect this unique area and guarantee access for the public. Hen Cloud is an impressive, solitary edge which rises steeply from the ground below. 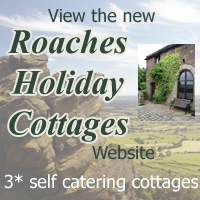 The Roaches themselves have a gentler approach and actually consist of two edges, a Lower and Upper tier, with a set of rock-steps connecting them. Built into the rocks of the Lower Tier is Rock Cottage, a tiny primitive cottage which was once the gamekeeper's residence and has now been converted into a climbing hut. Below and to the west of the main edge is a line of small subsidiary edges known as the Five Clouds. The area was once famous for its wallabies which were released during World War II from a private zoo at Swythamley. The wallabies managed to breed and survive until the late 1990s, when the last survivors seem to have disappeared. The whole area is a favourite place with walkers and rock-climbers, and the edges provide some of the best gritstone climbing in the country, with famous classic routes such as Valkyrie, the Sloth and The Swan. Sunset over the Roaches - Wow!